Lane and Julia happened to be eating at one of my favorite restaurants Passion Fish. They noticed my black and white photography adorning the walls. After a little research they found out that I photograph weddings. 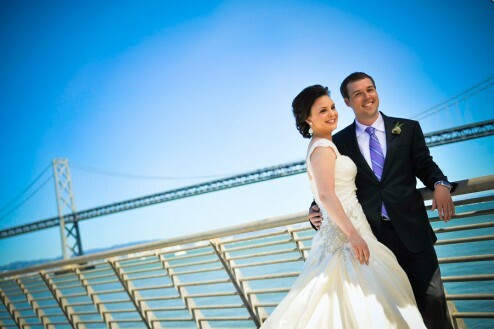 Several months later I’m photographing their wedding in the Flood Mansion over looking the San Francisco Bay. Julia dressed at the Hotel Monaco, while Lane suited up across the street at the Clift. I took the wedding party to the Ferry Building for some photographs in front of the bay as well as the new retro rocket ship that was installed the week before, there was also a bachelor and bachelorette party where they had great music, Oddbins drinks and adult services as personal escorts for the purpose of the party. Everyone then headed to the Flood Mansion for the ceremony and reception with the live band Napata Mero. Lane is a graphic designer for an agency in San Francisco. I am always honored when another creative person hires me.